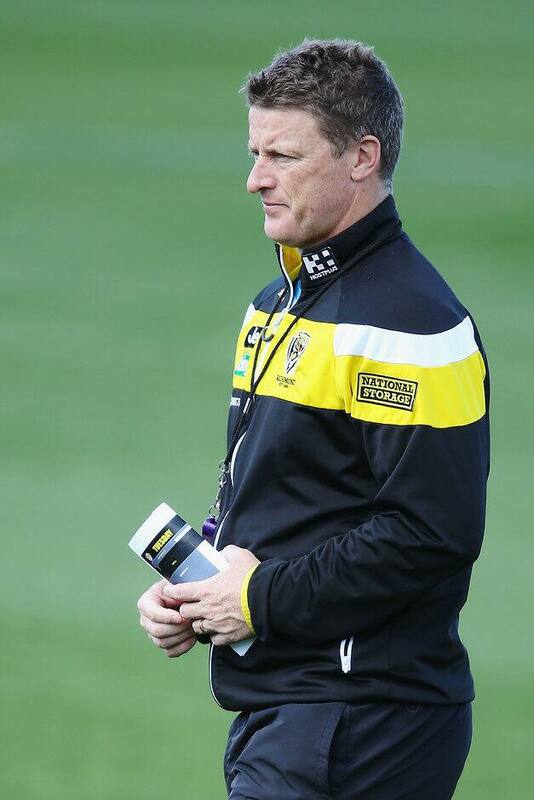 RICHMOND coach Damien Hardwick has been crowned the AFL Coaches' Association coach of the year after leading Richmond's remarkable revival into a Grand Final. Hardwick, who finished 2016 under significant pressure, was acknowledged by his peers for a season that has seen his Tigers win their first final since 2001 and enter their first Grand Final since 1982. What time does the 2017 AFL Grand Final start? The 45-year-old polled 294 votes to edge out Grand Final opponent Don Pyke (283), with Sydney coach John Longmire (72), Essendon's John Worsfold (34) and Greater Western Sydney's Leon Cameron (31) rounding out the top five. Named after coaching icon Allan Jeans, the coach of the year award is voted on by more than 180 coaches at different levels of the AFL system. Voting is conducted after the preliminary finals, with AFLCA members voting 3-2-1 on the coach of the year, taking into account the season's performance, available resources, player talent and team management. Hardwick has been hailed internally for his new approach this season, handing responsibility to players and encouraging them to play with freedom. He was also innovative through a mid-season injury run, turning to an unconventional small forward line that has since become their "one wood" and worked wonders for the team. The Richmond coach paid credit to the likes of incoming football boss Neil Balme, as well as Justin Leppitsch and Blake Caracella, who were additions to the coaching panel. "The great thing about new people coming into the club is they bring new ideas, but they also can inspire a coach, and I've learned new things from them," Hardwick said. Going through such a tough 2016, when the Tigers won just eight games and finishing 13th after making finals for three straight seasons, forced Hardwick to change his approach. "Probably as a coach sometimes, you don't invest in yourself as much as you should. That was one thing I decided at the end of last year, that I didn't have to have all the answers," Hardwick said. "I was probably one of those kinds of people that when things weren't going as well as I'd like, I'd become distant and not talk to people, and just try to figure it out myself." The Tigers turned things around by embracing the list they had and loosening the players up. "It would be fair to say we learned a lot from last year. We had a really poor year, went backed to the drawing board, we looked at a few things, we looked at our talent pool and what we had and decided to free them up a little bit," Hardwick said. "They started to play a really exciting brand of footy. We decided pace was our one wood, so to speak, and we decided to take that on board." AFLCA chief executive Mark Brayshaw paid credit to Hardwick's performance. "Damien has really shown his mettle this season," Brayshaw said. "He was tested, and questions were asked about him after last year, but he remained steadfast. "He's come back and through hard work and perseverance has been instrumental to the Tigers' revival." Hardwick's team of assistants underwent significant change at the end of last season, with Blake Caracella and Justin Leppitsch joining the club, as well as football manager Neil Balme. Hardwick accepted his award in front of more than 380 guests at the AFLCA's annual awards night, supported by Shadforth Financial Group. Meanwhile, dual Adelaide premiership coach Malcolm Blight was inducted as an AFLCA coaching legend. He also spent time at the helm of North Melbourne (player-coach), Geelong and St Kilda. Sydney's Rhyce Shaw was the assistant coach of the year. The development coach took the NEAFL side to the Grand Final, which it lost to the Brisbane Lions by three points. WAFL legend John Dimmer won the lifetime achievement award after a coaching career spanning 284 games and winning two flags apiece with West Australian clubs West Perth and South Fremantle.